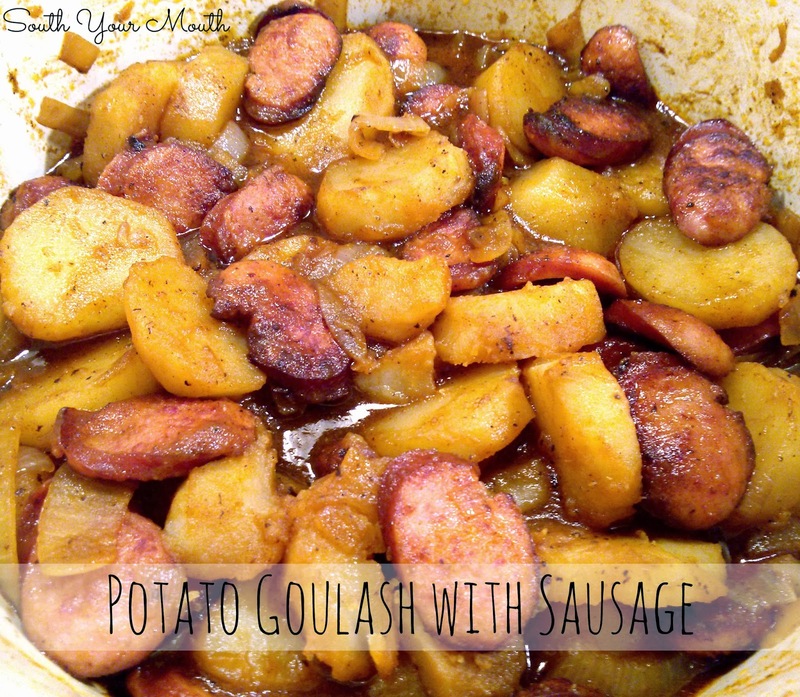 A rustic Hungarian goulash recipe with potatoes and smoked sausage. So… goulash. I have seen just about every combination known to man thrown in a pot and called goulash. So when I saw this recipe on Pinterest it really caught my eye because it didn't look like most I've seen. And quite honestly, the photos were so beautiful, I didn't care what it was called. I just wanted to eat it. A lot of it. I was thinking about it when it dawned on me that I actually had what I needed on-hand to make it. I hardly ever have potatoes around since we’re such big rice eaters so I took it as a sign from the goulash gods that I needed to make it. Like, right now. I made it and fell in love with it. I sopped up the rich potatoey stewy broth with a hunk of crusty bread and came close to hurting myself when I went back for seconds. I asked on the Facebook page what sorts of things folks put in their goulash and heard a lot of y’all mention noodles, tomatoes and ground beef. I did a little research on goulash and learned that it’s a Hungarian dish that can be made of most anything so long as there’s meat and paprika in it. The noodles were an addition made by Americans. And the potato version I made is a form of goulash called Paprikas Krumpli. So anyway, however you like your goulash, you ought to give this one a try because Lord, it sure was good! Brown sausage in vegetable oil over medium-high heat in a 12-inch Dutch oven or heavy pot* until nicely browned and crisp around the edges. Remove sausage from oil with a slotted spoon; set aside. Add onions to hot oil and sauté for 5 minutes. Add paprika, salt, garlic and pepper and continue cooking for 2 more minutes. Add potato slices to onions and stir until potatoes are nicely coated with onions and seasonings. Add beef broth and bring to a slight boil. Reduce heat to medium and continue simmering, uncovered for 15 minutes; stirring occasionally. You may have to poke the potatoes around for a bit to make sure they stay submerged (or mostly submerged) in the broth. Stir in sausage, reduce heat to low then continue cooking, uncovered, until potatoes are tender; stirring occasionally. *it is important to use a pot close to 12 inches in diameter to ensure the broth will be deep enough to cook the potatoes. this goulash does look delicious. I'll be making it as soon as I can. You're right - looks very different from the regular tomato/macaroni/ground beef goulash that's so prevalent. This one looks soo good! Thanks for sharing! This was awesome! Loved it and so so simple! Thank you again for such a wonderful dish! Making this right now! It smells AMAZING!!! This was soooo good! Hubby said make it again, it's a keeper! Make it exactly as recipe except I had a half each of a green and yellow bell pepper left over in the fridge and cut them up and tossed them in...turned out awesome! My husband and I both loved it!! I thought I had paprika but did not so used Cajun seasoning and was excellent. Thanks for all your wonderful ideas! Made this for the kids, they really liked it. Leftovers will warm up real nice and only one pot to cleanup. Excellent recipe! My husband will love this recipe. Thank you for sharing. Love one pot meals and this one sounds awesome. My father is Hungarian, so I grew up eating this dish along with beef and chicken goulash. He sometimes would even make chicken gizzard goulash. The only difference is we didn't use the beef broth and we used a lot more paprika. I have also been fixing these dishes for my family and they love it as much as I do. Thanks for all your recipes, I look forward to trying them. Not a big fan of beef broth. Do you think chicken or vegetable broth would work? Also do you think adding cabbage would work? I used vegetable broth, added cabbage with the potatoes, needed an extra cup broth, it was very good. I was conservative on the cabbage, and afterwards the family said next time to add more cabbage. Just made this tonight! It smell so good while cooking. My family really enjoyed it. I will be making this dish again. Hello! 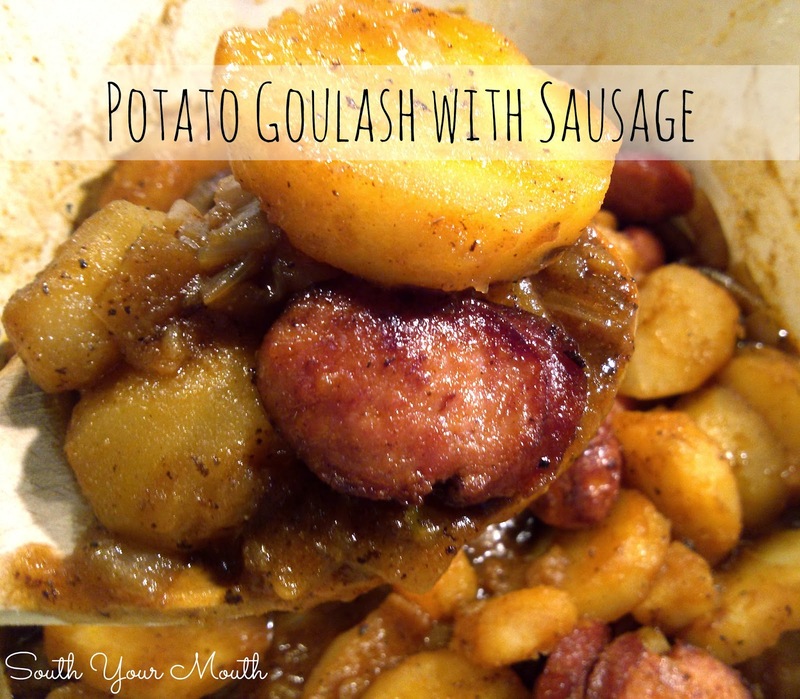 Has anybody tried this with raw sausage, as opposed to the cooked smoked sausage? I have some Polish sausage that I need to do something with, and I'm hoping that maybe I can just modify and saute/brown the sausage longer? Thank you!